Is Northern Trust Corporation (NASDAQ:NTRS) a good bet right now? We like to analyze hedge fund sentiment before doing days of in-depth research. We do so because hedge funds and other elite investors have numerous Ivy League graduates, expert network advisers, and supply chain tipsters working or consulting for them. There is not a shortage of news stories covering failed hedge fund investments and it is a fact that hedge funds’ picks don’t beat the market 100% of the time, but their consensus picks have historically done very well and have outperformed the market after adjusting for risk. Northern Trust Corporation (NASDAQ:NTRS) has seen an increase in hedge fund sentiment of late. Currently the overall sentiment towards NTRS is at its all time high. This is usually a very bullish signal. For example hedge fund sentiment in Xilinx Inc. (XLNX) was also at its all time high at the beginning of this year and the stock returned more than 46% in 2.5 months. We observed a similar performance from Progressive Corporation (PGR) which returned 27% and outperformed the SPY by nearly 14 percentage points in 2.5 months. Hedge fund sentiment towards IQVIA Holdings Inc. (IQV), Brookfield Asset Management Inc. (BAM), Atlassian Corporation Plc (TEAM), RCL, MTB and CRH hit all time highs at the end of December, and all of these stocks returned more than 20% in the first 2.5 months of this year. We’re going to review the key hedge fund action regarding Northern Trust Corporation (NASDAQ:NTRS). How have hedgies been trading Northern Trust Corporation (NASDAQ:NTRS)? Heading into the first quarter of 2019, a total of 37 of the hedge funds tracked by Insider Monkey held long positions in this stock, a change of 6% from the second quarter of 2018. 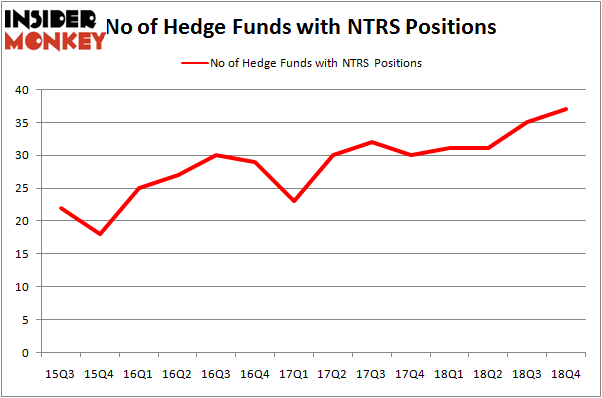 The graph below displays the number of hedge funds with bullish position in NTRS over the last 14 quarters. With hedge funds’ sentiment swirling, there exists an “upper tier” of noteworthy hedge fund managers who were boosting their holdings considerably (or already accumulated large positions). More specifically, Ariel Investments was the largest shareholder of Northern Trust Corporation (NASDAQ:NTRS), with a stake worth $145.7 million reported as of the end of September. Trailing Ariel Investments was Citadel Investment Group, which amassed a stake valued at $143.1 million. Carlson Capital, GAMCO Investors, and Alyeska Investment Group were also very fond of the stock, giving the stock large weights in their portfolios. With a general bullishness amongst the heavyweights, key money managers were leading the bulls’ herd. Lomas Capital Management, managed by Daniel Lascano, created the biggest position in Northern Trust Corporation (NASDAQ:NTRS). Lomas Capital Management had $6.3 million invested in the company at the end of the quarter. 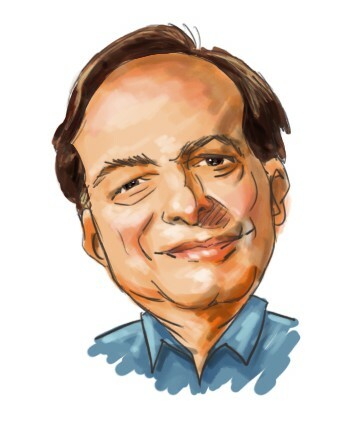 Ray Dalio’s Bridgewater Associates also initiated a $5.6 million position during the quarter. The other funds with new positions in the stock are John Overdeck and David Siegel’s Two Sigma Advisors, David Andre and Astro Teller’s Cerebellum Capital, and Claes Fornell’s CSat Investment Advisory. Let’s now review hedge fund activity in other stocks similar to Northern Trust Corporation (NASDAQ:NTRS). These stocks are Edison International (NYSE:EIX), Sasol Limited (NYSE:SSL), Hewlett Packard Enterprise Company (NYSE:HPE), and Newmont Mining Corp (NYSE:NEM). This group of stocks’ market caps are closest to NTRS’s market cap. As you can see these stocks had an average of 23.75 hedge funds with bullish positions and the average amount invested in these stocks was $573 million. That figure was $732 million in NTRS’s case. Newmont Mining Corp (NYSE:NEM) is the most popular stock in this table. On the other hand Sasol Limited (NYSE:SSL) is the least popular one with only 7 bullish hedge fund positions. Compared to these stocks Northern Trust Corporation (NASDAQ:NTRS) is more popular among hedge funds. Our calculations showed that top 15 most popular stocks among hedge funds returned 19.7% through March 15th and outperformed the S&P 500 ETF (SPY) by 6.6 percentage points. Hedge funds were also right about betting on NTRS, though not to the same extent, as the stock returned 14.3% and outperformed the market as well.